tree nuts, wheat, soy, fish and shellfish. Did you know that the month of May has been designated National Allergy Awareness Month? 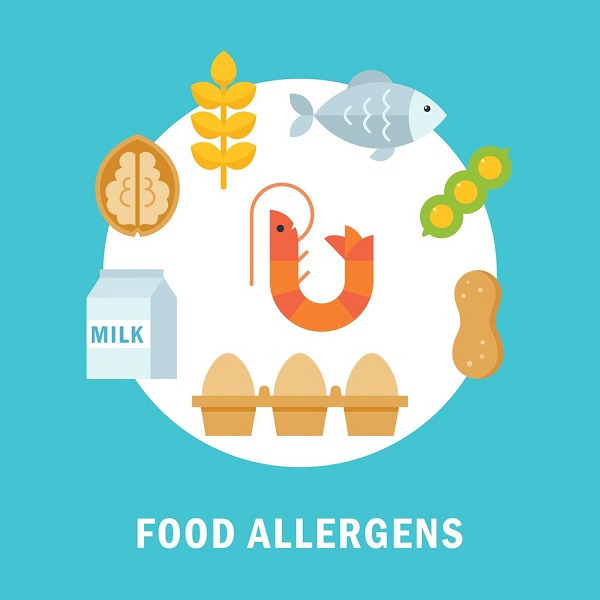 While many of us are sneezing our way through the pollen season, we should also remember many people are affected by food allergies every day. Food allergies are a growing health concern, especially for children. It is estimated that 6 million children, or 8 percent of the child population, have food allergies. And the Centers for Disease Control and Prevention reports that these numbers are on the rise - increasing 50 percent between 1997 and 2011. A food allergy is a condition in which a person’s immune system reacts abnormally to a component of a food. Some allergic symptoms are mild, but some can be life-threatening, with serious symptoms that happen quickly. Ninety percent of all allergies are caused by these eight foods: milk, egg, peanut, tree nuts, wheat, soy, fish and shellfish. There is no cure for food allergies. The best preventative strategy for food allergies is to strictly avoid the foods that are allergens. Children with known food allergies should also have epinephrine, an adrenaline medication, available to them at all times to treat anaphylaxis. The Food and Nutrition Service’s (FNS) Office of Food Safety works in collaboration with the Center for Food Safety Research in Child Nutrition Programs and the Institute of Child Nutrition to provide school nutrition professionals with the resources that they need to confidently provide safe meals to children with food allergies. The Center for Food Safety Research conducts research that is specific to the school nutrition environment, and the Institute takes that research and translates it into educational resources for school nutrition professionals in various formats. They have launched several new resources to help school nutrition professionals keep children with food allergies safe in the school environment. Managing food allergies is challenging, especially in the school environment. More than 15 percent of school aged children with food allergies have had reactions in school, and approximately 20-25 percent of epinephrine administrations in schools were for children whose allergies were unknown at the time of the reaction. For this reason, schools have to be proactive about allergy management, and know what to do in an allergy emergency. Caitlin Remembered is an impact video that was developed by the Center for Food Safety Research in Child Nutrition Programs. Based on their food allergy and behavior change research, the brief dramatization of a food allergy incident in a school setting promotes awareness of food allergies in the school environment, and encourages staff to consider the roles they play in managing a student’s allergies. The video integrates emotion, sincerity, and realities involved with food allergy management in schools. Allergic reactions can happen anywhere, not just in the school cafeteria. As part of a newly expanded food allergy training course for school nutrition directors, a scenario has been developed that allows school personnel to evaluate their school’s readiness to respond to an allergic emergency outside of the cafeteria. The scenario involves a severe allergic reaction on a school bus. As the situation unfolds, questions are asked about how school staff would respond at each step of the way. When the scenario ends, participants can consider their specific operations and address any areas of concern. Using a scenario in this way allow school nutrition professionals to practice their plans, and to evaluate their local policies and procedures without the pressure of a child’s life being at stake. More information about these resources can be found on the Food and Nutrition Service’s website at: www.fns.usda.gov/ofs/food-safety; Policy Memorandum on Modifications to Accommodate Disabilities in the School Meal Programs or the Institute of Child Nutrition at www.theicn.org or by calling their Help Desk at 800-321-3054.